This Project will only be funded if USD 4,800 is pledged by Wednesday, 7 March 2018 23:59 HKT. 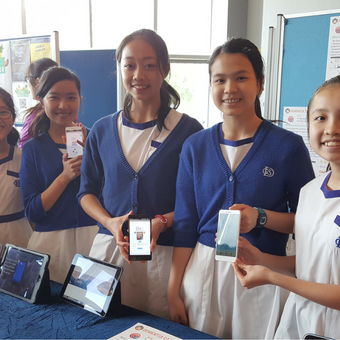 TechnovationHK – Join the Movement and Support Hong Kong Girls Succeed in Technology and Entrepreneurship. If you can teach and encourage a Hong Kong girl to embark on a journey embracing computer science and entrepreneurship, she can not only create her own job and 21st century career, but also help create innovative solutions to solve some of our today's most pressing problems. According to US charity Girls Who Code, tech jobs are among the fastest growing in the US, yet girls are being left behind. In particular, the biggest drop off in interest in computer science tends to happen between the ages of 13-17. Technovation Challenge was created by US charity Iridescent to increase engagement amongst school girls in technology and entrepreneurship for the jobs of tomorrow, and to build the talent pipeline for girls in STEM to embrace the opportunities in the tech industry. 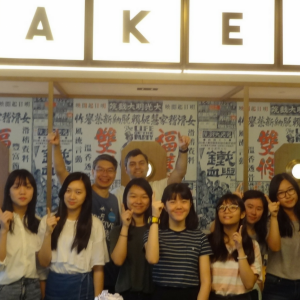 In early 2017, social enterprise Young Makers & ChangeMakers (YMCM) brought the world’s longest running global technology entrepreneurship challenge especially for girls for the first time to Hong Kong, and we want to be able to impact more girls across Hong Kong. With the support of the Hong Kong SAR Education Bureau and Innovation and Technology Bureau, 290+ girls aged 10-18 forming 80+ teams from 40+ schools across Hong Kong guided by 100+ mentors participated in Technovation and learned to ideate, prototype and create a mobile app solution using MIT AppInventor to address UN Sustainable Development Goals in the areas of education, environment, equality, health, peace and poverty. a Hong Kong Pitch Finals and Celebrations co-organized with Cyberport, where notwithstanding the inaugural year of this challenging competition, Hong Kong fielded 22 teams who created innovative app solutions that addressed issues ranging from pollution, dementia, emergency care, waste, charity fundraising etc. And all of this was offered for free to the girls, and was powered mainly by student volunteers from organisations such as the awesome Hong Kong Joint Students Association of Student Unions (HKJSASU) and by wonderful volunteer facilitators and mentors (including dedicated teachers). It is with great pride that we announce our top Junior Team (Dementia Care Companion) beat 1100 teams worldwide at the World Pitch Summit in San Francisco, which were held from 7-11 August, and took home the World Grand Prize in the Junior Division. On this fantastic journey, they were joined by our top Senior Team (Team SPCS), which attended the Summit as a Visiting Team, fully sponsored by Alibaba Entrepreneurship Fund Hong Kong. And beyond the Technovation competition, we have facilitated and encouraged teams of girls to participate and pitch at industry events such as StartupWeekend: Women In Tech, Pitch Like a Girl and RISE Conference. We were very fortunate to have the cool venues and prizes for the girls been generously sponsored by various companies, but to date, no cash sponsorship has been received to cover out-of-pocket costs and expenses. 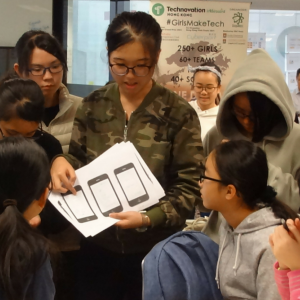 We wanted to help build a better sense of community amongst the Hong Kong girls by eg, providing them with #GirlsMakeTech T-shirts, but lacked funds. 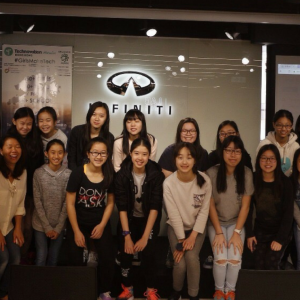 In the 2018 season, we want to be able to grow the program even bigger and better for more Hong Kong girls, such as being able to pay small stipends to university students to help the girls with troubleshooting their code solutions, and hiring a part-time administrator to better co-ordinate with the many schools and mentor enquiries about the Technovation English-language platform and processes. With your help, we can ensure that many more girls across Hong Kong will get the opportunity to be part of this growing educational journey and community. Please support our initiative to help Hong Kong girls succeed in technology and entrepreneurship, and receive some of the cool one-of-a-kind and collectible rewards listed down here, all of which are designed to let you feel and be part of the movement of #GirlsMakeTech! Please note that these are not the final designs - we plan to refine them so that these are items all TechGirls and their Supporters would be proud to wear. We will reach out to you regarding T-shirt sizes. Please also note that these rewards are with individual backers in mind - if you are a corporate and/or charitable foundation, please contact us separately for tailored opportunities to collaborate on this initiative. So… please join the movement and support #GirlsMakeTech now! Early bird price limited to our first 20 backers - collectible #GirlsMakeTech T-shirt for TechGirls - one T-shirt for you or a TechGirl in your life, and one for a girl in next year's TechnovationHK. Spread the movement! Early bird price limited to our first 20 backers, all above 4 rewards (Digital, Sticker, Charm, T-shirt) for Techgirls to show they are real fans - one T-shirt for you, and one for a girl in next year's TechnovationHK. Spread the movement! Early bird price limited to our first 20 backers - all above 4 collectable rewards (Digital, Sticker, Charm, T-shirt) for Supporters to show they are real fans - one T-shirt for you, and one for a girl in next year's TechnovationHK. Spread the movement! Collectable Digital #GirlsMakeTech badge for TechGirls social medial cred - post on Facebook, Instagram, Twitter, WeChat, Snapchat for yourself or TechGirls in your life... Spread the movement! Early bird price limited to our first 20 backers - collectible #GirlsMakeTech T-shirt for Supporters - one T-shirt for you, and one for a girl in next year's TechnovationHK. Spread the movement! Collectable Digital #GirlsMakeTech badge for TechGirls Supporters social medial cred - post it on your Facebook, Instagram, Twitter, WeChat, Linked-In... Spread the movement! Collectable #GirlsMakeTech sticker for TechGirls tech startup cred to add to laptops, etc. for yourself or TechGirls in your life. Spread the movement! Collectable #GirlsMakeTech sticker for TechGirl Supporters tech startup cred to proudly show on their laptops, etc. Spread the movement! Collectable 3D-printed #GirlsMakeTech charm that can be used as a keychain, on bag, bracelet, cellphone, etc for for yourself or TechGirls in your life to wear with pride. Spread the movement! Get all three above collectable rewards (Digital, Sticker, Charm) for yourself or TechGirls in your life. Spread the movement! Collectable 3D-printed #GirlsMakeTech charm that can be used as a keychan, on a bag, bracelet, cellphone, etc for Supporters to wear with pride. Spread the movement! Get all above 3 collectable rewards (Digital, Sticker, Charm) for Supporters. Spread the movement! Collectable #GirlsMakeTech T-shirt for for yourself or TechGirls in your life - one for you, and one for a girl in next year's TechnovationHK. Spread the movement! Collectable #GirlsMakeTech T-shirt for Supporters - one for you, and one for a girl in next year's TechnovationHK. Spread the movement! All above 4 collectable rewards (Digital, Sticker, Charm, T-shirt) for TechGirls to show they are real fans - one T-shirt for you and/or a TechGirl in your life, and one for a girl in next year's TechnovationHK. Spread the movement! All above 4 rewards (Digital, Sticker, Charm, T-shirt) for Supporters to show they are real fans - one T-shirt for you, and one for a girl in next year's TechnovationHK. Spread the movement! Six T-shirts for you, and six for girls in next year's TechnovationHK. Spread the movement! Please note: Delivery arrangement and amount to be communicated. All 4 collectable rewards (Digital, Sticker, Charm, T-shirt) for 20 TechGirls (ie, at least 4 teams) and 2 Supporters, 22 T-shirts for you and your school, and 22 for girls in next year's TechnovationHK. 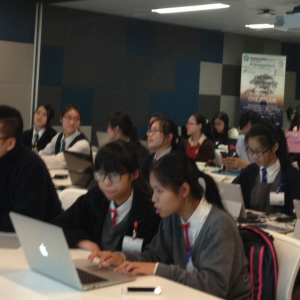 Plus, we will provide a presentation at a school of your choice on TechnovationHK: #GirlsMakeTech ! Our track record for making such presentations has been superlative: many of this year's award winners came from schools where we personally made presentations! This is an ideal reward for School Alumni Associations and/or donors who want to support their child's school, or nominate an underserved school that would benefit from reward. Delivery arrangement and fee to be communicated.